Vengaboys were mostly successful in European dance clubs. But their music also crossed the pond to US clubs and the 1998 single We Like To Party! even got mainstream radio play. 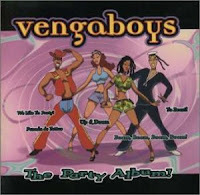 Vengaboys is two Dutch producers who usually hired singers and dancers to perform the music. The producers are Wessel van Diepen and Dennis van den Driesschen. They call themselves Danski and Delmondo. They are from Rotterdam, The Netherlands. van Diepen started out as a DJ in the 80s and he teamed up with van den Driesschen and they started performing live in 1992. In 1996, they decided to hire singers/dancers to tour as Vengaboys. They hired Kim Sasabone, Denise Post-Van Rijswijk, Roy den Berger and Robin Pors. They released an album on their own label in 1998. The single Up & Down was a hit in England it was picked up by the US dance label Strictly Rhythm. The 1999 album The Party Album! is a reworked version of Up & Down. For the most part, Vengaboys were successful in Europe. But We Like To Party! reached #26 on the Billboard Hot 100. Who's singing? The singer is never identified. It could be a studio singer. But Denise has recorded albums so I assume it's her. Vengaboys continued to have dance hits mostly in Europe. But then Pors left to go solo and Vengaboys split up in 2001. They eventually reunited and tour today. They release occasional singles and a Christmas album in 2015. Here's the video for We Like To Party! (Vengabus) by Vengaboys.